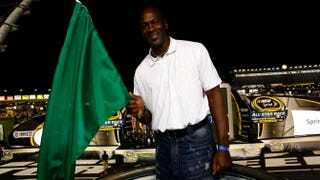 Michael Jordon poses in the flagstand prior to the start of a NASCAR race May 22, 2010, in Concord, N.C.
Michael Jordan is known for a lot of things. His slam dunks, expensive sneakers and bald head. But there’s one thing that stands out among all of those. Sure, Jordan’s name is synonymous with basketball and Nike, but that doesn’t mean he isn’t going to dress like that uncle everyone always runs away from at the family cookout. Jordan’s outfits even have a site dedicated to them. Don’t be like Mike when it comes to your clothes.